The aluminium operator interface control panel, OICP, has a pre-machined hole pattern to allow for the desired fixation to a swing arm, plus a removable front plate at a IP 65 protection degree. Components can be easily fitted thanks to the removable front plate, but will also be easily accessible through a removable rear panel. Side handles on the enclosure allow for easy movement of the enclosure into the desired working position. The aluminium body will dissipate more heat than a mild steel body, which may eliminate the need for additional ventilation. Body: Al Mg Si05. Rear plate: Al Mg. Corners: AlSI 12. Body and rear plate: anodised aluminium. Corners: RAL 7016. OIFP front panel is not included in the standard delivery and needs to be ordered separately. Body, screwed rear plate, front plate mounting kit, and mounting accessories. Aluminium operator interface control panel, with a pre-machined hole pattern to mount onto a swing arm system, removable aluminium front plate accessory and a IP 65 protection degree. Components can be installed easily because of the removable front panel (supplied as an accessory) and accessible because of the removable rear panel. The enclosure's pre-machined cut-out allows the panel to be quickly mounted to the swing arm system in the field. 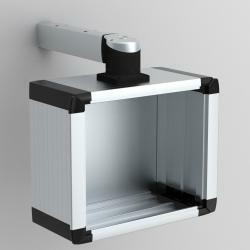 The pre-mounted enclosure side handles allow customers to manipulate the enclosure easily when performing operations. The aluminium body will dissipate a larger amount of heat, that has been generated from the installed components. The enclosure reduces customer's labour cost and allows ergonomic use in the field, due to the pre-installed handles. The internal temperature of the control panel is kept low which may remove the requirement for ventilation. The aluminium front plate (OIFP), must be ordered separately.